Hello, my name is Thomas Byrne (Tommy) and I am the proud owner of Blue Frost Heating &amp; Cooling. The company has been in business since 1973 and I purchased the company in March of 2009. Since that day I have made this my life’s work. My goal is to bring the highest possible level of service to my customers. I believe that is the key to growing a successful business! That’s a simple and straight forward explanation about the focus of our entire company! I’ve been blessed to be able to surround myself with likeminded highly skilled and motivated technicians and office staff. If you work with the best people, use the best equipment and materials available, you’ll end up with the highest quality of work. That is what we stride for every day and my commitment to our customers! I started my career over 23 years ago as a student in the Harper College HVAC program. Shortly after getting started with school I went to work for a close family member as a service technician and worked on both commercial and residential equipment. Working for a small company there was a need for people to be flexible and I was. I pitched in wherever I was needed and that allowed me to learn the installation side of the business as well. I am NATE certified, carry a universal refrigerant card and have just about every certification a technician can acquire in this industry. I take the same attitude with my employees about training and provide considerable ongoing training for them so they too reach higher levels of knowledge. Blue Frost invests in them so they can perform better for you. When I’m not at work you might find me amongst my 6 children and beautiful bride Molly! I am a very family orientated person and am quite active with my children at school, church and home. We do love taking trips to the ocean whether in Florida or South Carolina, if there is a beach we’ll be having a blast together on it. My wife and I do enjoy a dinner out especially if its fish. My hobbies include golf, cars, paint ball and the CUBS! My wife and I support many charities as we believe giving back to the community is a privilege and honor. Additionally we volunteer our time for activities at the schools and the church our family attends. It lets us be a bigger part of their lives and it is quite rewarding. 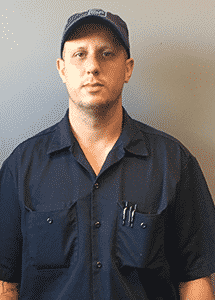 Hello, my name is John Yelton and I am the Field Operations Manager here at Blue Frost. I’m responsible for all installations and service work we perform in your home. I love my position with Blue Frost because it allows me the opportunity to help people. Anyone who knows me understands that is part of who I am. I take tremendous pride in resolving customer issues and aiding in the growth of our employees. With over 17 years of HVAC and management experience I am able to train and guide our teams of technicians to even higher levels of performance. After-all, our customers expect the best, we intend to deliver! Over the years I have been certified to work on all brands of HVAC equipment so there isn’t much that surprises me. Hello, my name is Tom Wangler and I'm the Sales Manager at Blue Frost Heating & Cooling. My goal is to bring the highest possible level of service, knowledge & quality to our customers. Like my team at Blue Frost, I am committed to a total customer care experience. With over 20 years in the industry I feel confident in making sure that our customers get the best service possible, whether they are having their system repaired or replaced. I am passionate about what I do & dedicated to ensuring homeowners & businesses find the right heating & cooling solutions & products to best fit their individual needs, goals & budget. Hi, my name is Amy Zukas and I am the office manager here at Blue Frost Heating & Cooling. With over 18 years of ffice management experience I am accustomed to a dynamic office environment..
Hi, my name is Amy Zukas and I am the office manager here at Blue Frost Heating &amp; Cooling. With over 18 years of office management experience I am accustomed to a dynamic office environment. As the office manager, I am ultimately responsible for everything that goes on inside the office including the customer service we provide. Taking great care of your customers is a huge priority here and my many years of working in accounting have trained me on details, some that I excel in. We have a terrific office staff here and that alone makes my position that much more fun. We have each other’s backs and truly support one another. I have been trained on several different financial software packages including quick books. In addition, I hold an Associate’s degree from the College of DuPage in Business Administration. I’m proud to say that I am the go to person in the front office of Blue Frost! When I’m not at work I enjoy spending time with family and friends. That time includes many outdoor activities like camping, swimming and of-course traveling around the country. Traveling is by far my favorite thing to do. I love meeting the people from around the country and talking about traditions, family and food! It is amazing how different we are from one part of the US to another. There is an endless supply of great times and interesting places to visit across this country. Additionally, I am a sports nut. I follow all types of sports but my love is football, so for me, it’s common place to catch a game on a Sunday afternoon. Hi, I’m Tracey Berg Blue Frost’s inside sales/marketing consultant. I have developed and over-see many projects for the company. One of those projects which is near to my heart is our Energy Savings Program. It is a way that I can help save our customers money on their maintenance and repairs as needed. I love the interaction with the customers and our vendors as we all work together to deliver superior customer service. Whether it is helping a customer out with a warranty issue or making sure their equipment is running efficiently, I’m up to the challenge. I have worked in office environments for nearly 7 years now with 4 of those years in HVAC. I understand the industry language so I can help our customers understand what’s wrong in their home as they need help. Like Blue Frost, I am committed to providing the best possible experience for our customers. I have many certifications including in the areas of dispatching, leadership, and customer service. All of which allow me to work more efficiently and effectively to help our customers. When I relax I often spend time with family and friends taking in a concert and dinner or enjoying some outdoor activities like Biking or Golf. I love to travel and explore different parts of the country as you never know what you’re going to discover. I believe that giving back to the community is a privilege and there-fore I support many Charites including Feed My Starving Children, Easter Seals and Pads DuPage. I am the newest member of the Blue Frost family of employees but I fore see a long future here. It’s easy to see when you love what you do. Hello, my name is Stephanie Bowser and I am the Customer Service Representative for Blue Frost. My primary..
Hello, my name is Stephanie Bowser and I am the Customer Service Representative for Blue Frost. My primary responsibility is to take care of our customers calling in for service or sales help. So yes, I’m the friendly voice you hear on the other side of the phone when you call us. I gather all info and make sure they get scheduled or sent on to the correct person. I maintain several data bases for the company including our customer files. The need for accuracy in my position is extremely high and that is where I really shine as paying attention to all the little details is what I’m really good at. I’ve worked in several different office environments for over 10 years combined with the last year here at Blue Frost in the HVAC industry. I love the company’s focus on customer service, we never get rushed and in fact are encouraged to work at improving communication with our customers for a better over-all experience. When I’m not at work it’s fair to say you’ll find me spending time with my family and in particular my sister and close friends. Much of my family live up north so my sister and I and our families are very close. For me, my favorite thing to do is share what’s going on in my life with the people that mean the most to me. We do many things together such as bike ride and go for walks. If I’m taking the dogs it may seem like they are walking me but we are both getting our exercise. I do enjoy a great meal out, Chinese food, Mexican food and just a plain Hamburgers are all great choices! It is said Variety is the spice of life and that really applies to food.